Identifying your nurse practitioners will go a long way towards making your patients more comfortable, eliminating questions about who is providing care. "Is this person doctor? Is she a nurse?" Badge Buddies make those questions a thing of the past. 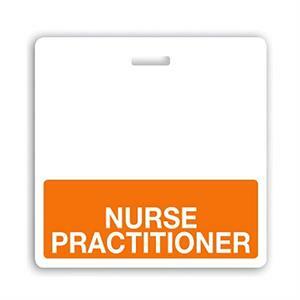 These durable role-recognition cards feature bold "NURSE PRACTITIONER" text, allowing patients, guests and staff to quickly identify your NPs with a simple glance. Our Badge Buddies allow you to add visible role recognition to your ID card program without issuing new badges to everyone. Badge Buddies also satisfy healthcare ID badge requirements for several states, including Pennsylvania and Texas. Bright colors. Bold text. Relief for your patients. Designed for CR80 cards (also known as credit card size), measuring 3.38" x 2.13"
Badge Buddy itself measures 3.38" x 3.09"